Teaching fundamental concepts such as latitude and longitude can be an opportunity for interactive and adventurous learning. 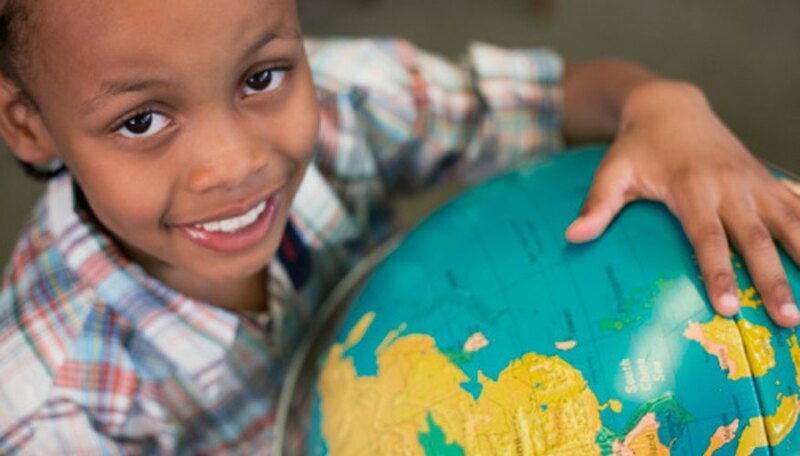 Educators can relate these geographical concepts to students in ways that make them popular and useful; finding your favorite city, or knowing exactly where someone is located, can become an empowering ability. It is important for teachers to incorporate hands-on tools and devices for latitude-longitude lessons to be effectively instilled. Begin by offering your learner basic knowledge of the Earth's degrees and definitions of latitude and longitude, two important concepts of geography that frequently work together. Just as a circle has 360 degrees all the way around, the Earth can also be divided into 360 degrees. Latitude measures those degrees that run east and west, from left to right. Longitude measures degrees running north and south, top to bottom. Be sure to mention the bases of latitude and longitude: the Equator and the Prime Meridian. The Equator is found at 0 degrees latitude, while the Prime Meridian (found in Greenwich, England) is located at 0 degrees longitude. Using these two positions can help students find any location in the world. Use a globe and invite students to find their favorite locations. They can discover that Paris, for instance, is located at 48 degrees north and 2 degrees east. Ask them to put their fingers on Paris' spot on the globe and see the map's actual markings for latitude and longitude. Most maps mark every 10 degrees, so encourage your students to take guesses with their own eyes at pinpointing locations, like Paris, not found directly on the degree marks. Head to Brainpop.com for an easy-to-understand video on latitude and longitude. Visit Google Earth for an interactive approach to this geographical principle. Stage a treasure hunt with GPS devices. Pick four to five locations around the school, home, park, or other suitable setting, and hide an object in one of them. Tell participants the latitude-longitude coordinates of these locations and invite them to find the treasure using them. Norman, Jeffrey. "How to Teach Kids About Longitude and Latitude." Sciencing, https://sciencing.com/how-to-teach-kids-about-longitude-and-latitude-12749932.html. Accessed 23 April 2019.